Transdermal drug delivery has become an important means of drug administration. It presents numerous advantages but it is still limited by the small number of drugs with a suitable profile. The use of solvents that affect the skin barrier function is one of the classic strategies of penetration enhancement. Some of these solvents have well characterised actions on the stratum corneum, but the majority are still selected using empirical criteria. 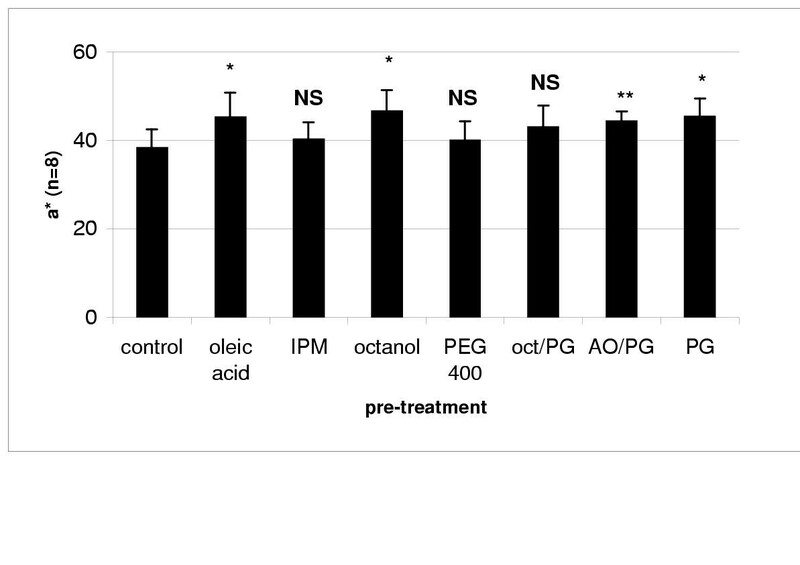 The objective of this work was to conduct a systematic study on the ability to affect skin permeation of solvents commonly used in transdermal formulations. An innovative methodology in this area was employed, consisting of the combination of skin surface biopsy with colorimetry. The study compared in vivo differences in the permeation of a hydrophilic (methylene blue) and a lipophilic (Sudan III) dye, after treatment of the skin with different vehicles. Consecutive skin surface biopsies of each site were taken and the cumulative amounts of the dyes in the stripped stratum corneum were measured by reflectance colourimetry. Results indicate that the amount of methylene blue present in the stratum corneum varied significantly with different skin pre-treatments. Some solvents provided a 1.5 fold penetration enhancement but others decreased by almost half the permeation of the dye. The permeation of Sudan III was less significantly affected by solvent pre-treatment. This study has only superficially explored the potential of the combination of skin surface biopsy and colourimetry, but the encouraging results obtained confirm that the methodology can be extended to the study of more complex formulations. Transdermal drug delivery (TDD) has become an important means of drug administration. When compared to the more conventional drug delivery strategies TDD presents numerous advantages : (a) avoidance of the variation in the absorption and metabolism associated with oral administration, (b) avoidance of the risks and inconveniences of injection, (c) permits continuous zero-order drug administration and the use of drugs with short biological half-lives, (d) increases the bioavailability and efficacy of drugs since hepatic first-pass elimination is bypassed and, finally, (e) provides a simple therapeutic regime, leading to good patient compliance, that can be easily terminated by simple removal of the patch. Nevertheless, the skin is an efficient barrier to the ingress of materials, which limits TDD to molecules with an adequate balance between lipophilic and hydrophilic characteristics, and an appropriate molecular size . Different approaches to penetration enhancement have been developed to overcome these difficulties. Classic physical penetration enhancement strategies include iontophoresis , electroporation , phonophoresis [5–7] or supersaturated solutions [8, 9], but recently novel approaches have been developed such as compressed gas propulsion  and the use of microfabricated microneedles to pierce the stratum corneum . Several chemical substances have been shown to possess the ability to enhance permeation across the skin, and are therefore commonly included in transdermal systems. These include low molecular weight alcohols , alkyl methanol sulphoxides , non ionic surfactants  (polysorbates, polyethoxylated alkyl ethers and esters and poloxamers), oleic acid in synergy with propylene glycol [15, 16] and azone [17, 18]. In spite of the wide use of chemical enhancers, there are still few guidelines for their rational choice and the exact mechanisms of action in the skin have not yet been fully established. In this context, the skin surface biopsy (SSB) technique can be regarded as an innovative strategy in the study of transcutaneous penetration. This simple and versatile approach to the study of the stratum corneum was introduced by Goldschmidt and Kligman in the 1960's  and was later developed by Marks and Dawber . If consecutive biopsies are performed in the same area it becomes possible to follow the permeation of a compound through the stratum corneum [21, 22]. SSB alone does not provide any data regarding the amount of chemical permeated through the epidermis and dermis into systemic circulation, but it can be combined with the determination of blood and urine concentration in pharmacokinetic studies. Corneosurfametry is also a technique that relies on SSB to assess the impact on the stratum corneum of surfactants used in cosmetics . The aim of the present study is to conduct a systematic in vivo study of the influence on percutaneous penetration of solvents commonly used as vehicles in transdermal systems. Differences in the permeation of two model permeant (methylene blue and Sudan III-the first with hydrophilic characteristics and the latter more lipophilic) after skin pre-treatment with the different solvents, were assessed using SSB and colourimetry . Five male and 5 female caucasian volunteers with normal healthy skin were used, and were fully informed of the nature of the study and of the procedures involved. The study was approved by the local ethics committee and is in compliance with the Helsinki Declaration. The age range was 21–28 years. Four sites were marked in each volar forearm of the volunteer and assigned at random: 1 site served as control and the other 7 were pre-treated with different vehicles. Oleic acid: propylene glycol 1:1. After this time the "chambers" were removed and replaced by others containing filter paper discs soaked with saturated solutions of either methylene blue (aqueous) or Sudan III (ethanol) (Merck, Germany), that were left in contact with the skin for 4 hours. The procedure was stopped at the end of the application time, and excess dye was gently washed with warm water. A drop of the adhesive glue was placed on a glass slide which was then placed over the skin, covered with a 200 g cylinder to ensure that constant pressure was applied, for 5 minutes . After this time the slide was quickly removed and the colourimetry measurement was performed on the resulting biopsy. This entire procedure was performed twice on each of the previously assigned sites (control and treated). The CIELAB (Commission Internationale de l'Eclairage L*a*b*) colour space system is widely used in cosmetology and dermatology . It enables a quantitative characterization of a colour using a three-dimensional axis, where L* represents lightness and a* and b* represent hue and chroma. The intensity of dye in each biopsy slide was measured using a Chroma Meter CR-300 (Minolta, Osaka, Japan), following published guidelines . The parameter a* reflects the red chromaticity and was therefore used to quantify the intensity of Sudan III whereas the b* parameter was used for methylene blue. Both parameters are expressed in arbitrary units. The cumulative intensity of colour in each site was then calculated by adding the values of a* or [b]* obtained after the corresponding first and second biopsies. Descriptive statistics and non-parametric comparative analysis (Wilcoxon sign rank test) were used in this study. A 0.05 significance level was adopted. As can be seen in Figure 1, the cumulative intensity of Sudan III present in the stratum corneum was higher when the skin was pre-treated with oleic acid, octanol and propylene glycol (PG) than in the control where the skin was not treated. There was a modest increase when the skin was pre-treated with a mixture of oleic acid 5% and propylene glycol (AO/PG). The enhancement ratios provided by each vehicle (vehicle cumulative a*/ control cumulative a*) are represented in Figure 2. None of the vehicles used in the pre-treatment yielded ratios that are significantly higher than one. Enhancement ratio of Sudan III provided by different solvent treatments (mean ± SD) IPM – isopropyl myristate; oct/PG – octanol: propylene glycol 1:1; AO/PG – oleic acid: propylene glycol 1:1; PG – propylene glycol. 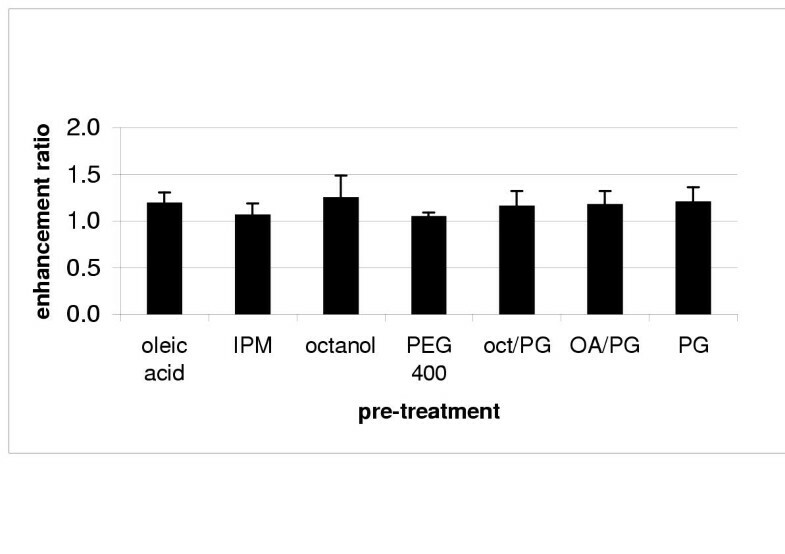 The effect of vehicle pre-treatment was more pronounced in the permeation of methylene blue, which increased significantly after pre-treatment with oleic acid, octanol and the oleic acid/PG mixture. 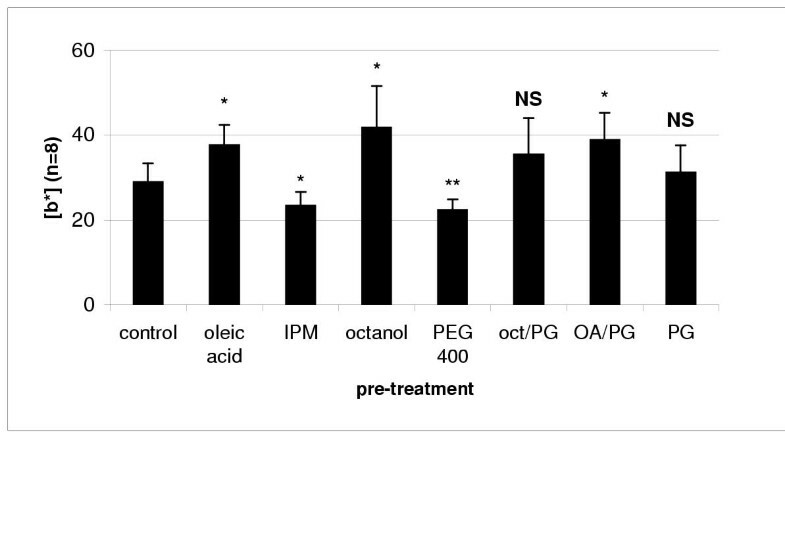 Interestingly, it also decreased when isopropyl myristate (IPM) and polyethylene glycol 400 (PEG 400) were used (Figure 3). The vehicle cumulative [b*] / control cumulative [b*] ratios obtained for methylene blue confirm that permeation was enhanced when oleic acid, octanol and oleic acid/PG were used (Figure 4). Pre-treatment with IPM and PEG 400 seems to have hindered the permeation of methylene blue since the ratios are significantly lower than one. Enhancement ratio of methylene blue provided by different solvent treatments (mean ± SD) IPM – isopropyl myristate; oct/PG – octanol: propylene glycol 1:1; AO/PG – oleic acid: propylene glycol 1:1; PG – propylene glycol. Pre-treatment with an octanol and propylene glycol 1:1 mixture (oct/PG) had no impact in the permeation of both Sudan III and methylene blue. Statistical differences between the enhancement ratios of all vehicle pre-treatments are represented in Tables 1 and 2. PEG 400 and IPM hindered the permeation of methylene blue and, therefore, more significant statistical differences were observed between the results provided by these vehicles and the other solvents that acted as permeation enhancers. For Sudan III, pre-treatments with propylene glycol and IPM yielded enhancement ratios that presented more significant differences to the other solvents. Several studies have been conducted on the influence of vehicles in drug permeation. Most of them were performed in vitro, using Franz cells and silastic membranes or excised human epidermis [27–30]. The work conducted in vivo has been based in methods that assess skin barrier function, such as laser Doppler velocimetry  and transepidermal water loss measurements , or in more invasive skin sampling techniques such as punch biopsy. Oleic acid and propylene glycol are generally considered classic penetration enhancers, increasing diffusivity within the barrier membrane and/or vehicle drug solubility-partitioning , and a synergy between these vehicles as also been previously established [30, 33]. The results of our study are in agreement with the previously reported findings, but a more marked effect was observed for the hydrophilic permeant. Propylene glycol only enhanced the permeation of methylene blue when applied in a binary mixture. Low molecular weight alcohols have been shown to possess the ability to enhance permeation across the skin. Their mechanism of action seems to be related to stratum corneum lipid extraction, particularly the more polar lipids . 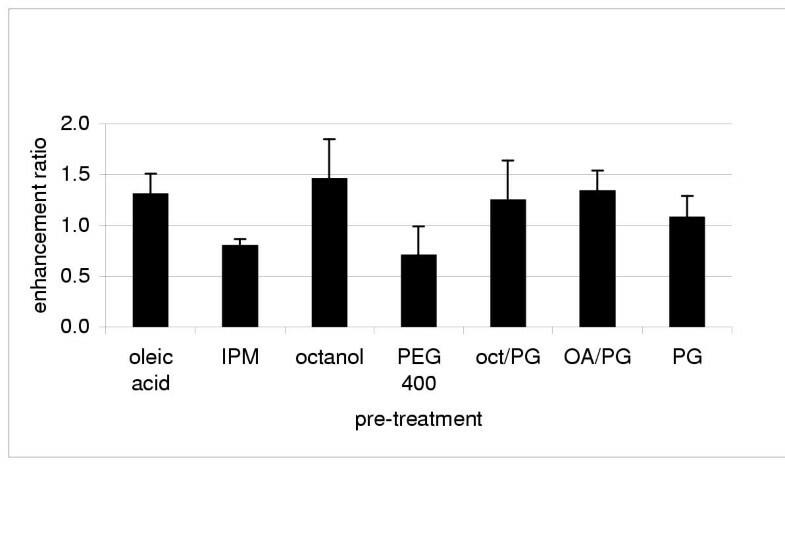 The data in our study showed that skin pre-treatment with octanol caused an increase in the permeation of the two chemicals. Statistical differences between the results obtained for Sudan III. * indicates p < 0.01; ** indicates p < 0.05 and NS indicates there is no significant difference. Statistical differences between the results obtained for methylene blue. * indicates p < 0.01; ** indicates p < 0.05 and NS indicates there is no significant difference. The work conducted aimed to investigate in vivo the influence of solvent pre-treatment in the permeation of a lipophilic and a hydrophilic compound, using a combination of the versatile technique of skin surface biopsy and colourimetry. Results showed that the two model permeants were influenced differently by the various treatments and that it was possible to cause more significant changes in the permeation of the hydrophilic molecule. Cases of penetration enhancement but also of retarders were observed. There was no simple correlation between the properties of the solvent and permeation enhancement. The permeation of Sudan III was less significantly influenced by any of the vehicles. Perhaps the partition of this molecule into the stratum corneum is already high and the vehicle pre-treatment did not significantly improve it. This study has only superficially explored the potential of the combination of skin surface biopsy and colorimetry, but the encouraging results obtained confirm that the methodology can be extended to the in vivo assessment of more complex formulations. CR conducted the practical work and participated in its design co-ordination. LMR participated in the design co-ordination. All authors read and approved the final manuscript. A post-doctoral grant provided by Fundação para a Ciência e Tecnologia (SFRH/BPD/5626/2001) is gratefully acknowledged.